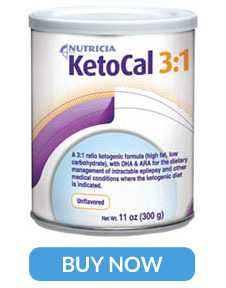 A nutritionally complete, ketogenic formula in a 3:1 ratio (fat:carbohydrate + protein) for the dietary management of intractable epilepsy and other medical conditions where the ketogenic diet is indicated; designed for individuals over 1 year of age. A medical food. Refined Vegetable Oils (Palm, Soy, Sunflower), Milk Protein (Casein, Whey), Lactose (Milk), Tricalcium Phosphate, Tripotassium Citrate, Corn Syrup Solids, Potassium Chloride, Calcium Phosphate Dibasic, Magnesium Acetate, Choline Bitartrate, L-Cystine, M. Alpina Oil*, C. Cohnii Oil**, L-Tryptophan, M-Inositol, Ferrous Sulfate, Sodium Caseinate (Milk), Sodium Chloride, Sodium Ascorbate, L-Ascorbic Acid, L-Carnitine, Taurine, Mono and Diglycerides, Zinc Sulfate, DL-alpha Tocopheryl Acetate, Niacinamide, Soy Lecithin, Calcium D-Pantothenate, Cupric Sulfate, Manganese Sulfate, Thiamine Chloride Hydrochloride, Pyridoxine Hydrochloride, Riboflavin, Vitamin A Acetate, Potassium Iodide, Folic Acid, Ascorbyl Palmitate, Mixed Tocopherols, Chromium Chloride, Sodium Molybdate, Phylloquinone, Sodium Selenite, D-Biotin, Vitamin D3, Cyanocobalamin.